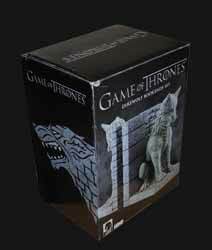 Now, if you're a serious Game of Thrones fan - or a gothic nut of any description - these book ends will make a stylish addition to your library. Made from poly-resin, they are heavy and extremely robust. We received review copies that had been around the houses a bit. They were packed in their original packaging (with no additional padding) and managed to arrive via the postal system in immaculate condition. So, if you're one of those fussy types that freaks if your purchase has the minutest of scratches on it, fear not, Dark Horse Deluxe know how to package their wares. 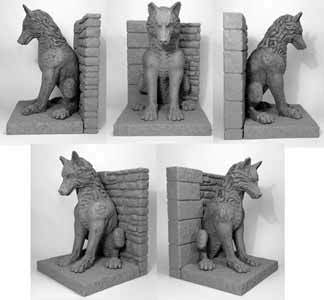 The actual wolves are carved by Gentle Giant Studios and are pretty impressive - they look weathered and a little rough around the edges which gives them a certain gothic charm. If your living room is looking a little dull, then these stylish bookends (you get a pair in the box) will make an excellent and stylish talking point in your house.